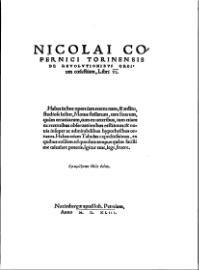 De revolutionibus orbium coelestium (On the revolutions of the heavenly spheres) is great work of the Renaissance astronomer Nicolaus Copernicus (1473–1543). The book, first printed in 1543 in Nuremberg, Holy Roman Empire of the German Nation, offered proof that the Earth went round the Sun, and not vice versa, as had been thought. This was an alternative model of the universe to Ptolemy's Earth-centered system, which had been accepted since ancient times. Copernicus had worked his ideas out many years before, but was afraid to publish, fearing the anger of the Roman Catholic Church. Finally, the book was published just before he died. In its standard English edition, the book contains 330 folio pages, 100 pages of tables, and over 20,000 tabulated numbers. The book is dedicated to Pope Paul III in a preface that argues that mathematics, not physics, should be the basis for understanding and accepting his new theory. Book I is a general vision of the heliocentric theory, and a summarized exposition of his cosmology. Book II is mainly theoretical and describes the principles of spherical astronomy and a list of stars, as a basis for the arguments developed in the following books. Book III describes the apparent movements of the Sun and related phenomena. Book IV is a similar description of the Moon and its orbital movements. Books V and VI are the exposition of the new system. They explain how to calculate the positions of astronomical objects based on the heliocentric model. This book is often referred to as the start of modern science. This page was last changed on 26 January 2015, at 21:03.